On May 17th 2011 I reported a €2.5 million price cut on the 53m motor yacht Blue Scorpion at YACHTZOO and today news arrives of a further €1.5 million price drop. Built in 2006 by Baglietto to Lloyds class and MCA compliant. her elegant Zen-inspired interior by Francesco Paszkowski accommodates 10 guests in a full beam master suite, two full beam double staterooms and two twin cabins and she has ample deck spaces. Twin 2700hp Caterpillar engines give Blue Scorpion a cruising speed of 15 knots and a range of 4,000 nautical miles at 12 knots. 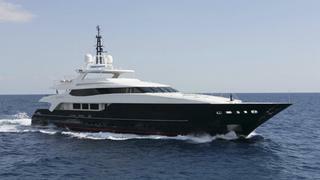 Her new asking price is €23.5 million.